Feedback has become completely integrated into all aspects of our lives. We go to a restaurant and give feedback after our meal. We take a class and give feedback for our teacher. We can even attend meetings and give feedback on how the meeting went. And of course, we give feedback on our how our managers are leading and how our team members are performing. The world of work is no different; team members are not looking for feedback from their team leaders, they’re looking for attention. And yes, that attention can and should be focused on how to help the team member get better – but that’s a far cry from feedback. That’s coaching. Imagine that your employee, the team member, is standing on one side of a fence. The difference between feedback and coaching lies on what side of the fence you, the team leader, are on. If you’re giving them feedback, it’s like standing on the opposite side of the fence, throwing a grenade over it, and covering your ears and running away after the damage is done. Hey, you’ve given them their feedback, now it’s their job to perform better, right? Team members don’t want that. No one wants that. We all want the team leader to come to our side of the fence, look at the world from where we’re standing, and tell us how to adjust from where we are to get better. If you’re going to give feedback, it has to come from a place of coaching. 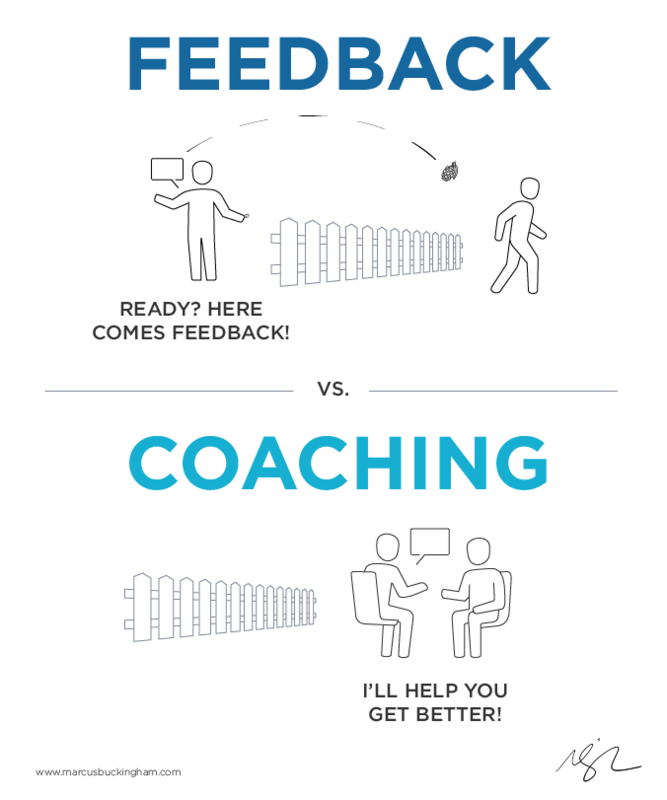 Nobody wants feedback, but everyone would appreciate being coached on how to course-correct to perform better. And maybe you want to give feedback, but you will never get the outcomes from it that you’re looking for. Unless, of course, making your team member defensive is your desired outcome. Your employees aren’t asking you to tell them where they stand. They’re asking you to tell them how to get better. Clip courtesy of the 2017 Global Leadership Summit. I really enjoy watching these short videos and totally support the philosophy behind them. It would be great to also have an example of information given in a feedback vs coaching context to really drive the message home. Thanks Marcus! Coaching is the better and more engaging way to success. In part, because it is about relationships that are effective. Nice and informative post. Feedback is very important process after any any service.